Ford has released a new Euro version of Ranger. The Wildtrak model tops the list in it most loaded form. Will it make it to North America? 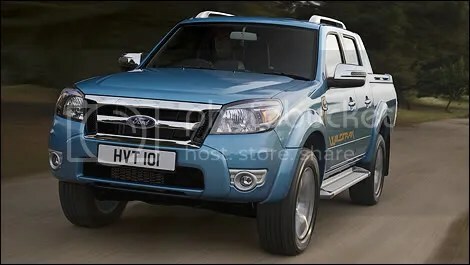 I understand Ford is looking to introduce a new Ranger in 2011. Maybe this is a pre-view. Ford is showing attendees of the Geneva Motor Show a fresh new Ranger pickup model in stark contrast to the long-lived model available to us North Americans. Distinctively European in its style and execution, the new Ranger boasts a fresh new look, turbo diesel engines, two or four wheel drive and exciting driving characteristics. Available in three body configurations, Ford says the new Ranger is set to play as hard as it works–both on the road and off. The Thailand-built model will appear in European Ford showrooms in April, maxing out as the loaded ‘Wildtrak’ model. Shoppers will appreciate the new three-bar grille with RANGER badging, integrated fog-lamps, fender vents and a sleeker, more dynamic look. Engineers have worked overtime to neutralize Nose, Vibration and Harshness (NVH), and all models will offer a CD/MP3 player with digital display. Under the hood, Ford’s Duratorq turbo-diesel engine lineup gives shoppers the choice between a 2.5-litre or 3.0-litre unit, with 143 or 145 horsepower, respectively. Fuel economy is rated as low as 8.3 L/100 km according to European measurement standards, and towing is rated as high as 6,600 lbs. No word yet on whether this new Ranger will make it to our shores, though. The Geneva show opens next month. Visit us 24 hours a day at mackenzieford.com and come on in if you are in the Portland Oregon area. Chrysler Financial has recieved money from the TARP program which will allow it to provide to offer more affordable credit to consumers who are looking to purchase new cars. This is one of the first times the federal money has actually gotten tothe average consumer it was intended for. Hopefully all car makers will be in a position to offer lower interest loans to more people very soon. The best and #1 rated Portland area Five Star rated Dodge dealer, Chrysler dealer, Jeep dealer near Beaverton Oregon. We have the 2009 Ram and 2009 Dodge Challenger available and instock for sale.Also come and see our Internet Special prices on used, pre-owned and certified vehicles. Bail-out money that actually gets to the consumer!!! With the tight credit market making new loans more difficult, the Federal Gouvernment is doing what it failed to do with the its bail out to the banks. It is making strategic loans that force money to flow to consumers and where it can not be horded into Corporate coffers to benefit the few. These loans are basically direct to the consumer with Chrysler Financial acting as a disbursing agent. Government loans Chrysler Financial to make loans to its customers, prompting zero-interest financing offer. NEW YORK (CNNMoney.com) — The Treasury Department, expanding its bailout of Detroit, announced Friday that it will loan Chrysler Financial $1.5 billion, opening the way for Chrysler to offer buyers interest-free loans to revive slumping sales. The Chrysler 0% offer came less than an hour after Treasury announced the bailout. The offer, available on select Chrysler, Dodge and Jeep vehicles, applies to loans of no more than five years. The government loan to Chrysler Financial is not on terms quite that attractive, but it makes money available to the firm much more cheaply that it has been able find in private markets. The firm will pay the one-month Libor rate, plus 1% in the first year of the five-year loan, and Libor plus 1.5% in the subsequent years. The government loan is separate from the $4 billion that Treasury agreed to loan Chrysler last month to keep the automaker from running out of the cash it needs to continue to operate. The so-called captive finance arms are crucial to the automakers because they provide loans to both their customers and their dealers. In the current credit crunch, the finance units’ difficulty in grouping those loans together into securities has cut them off from funds needed to make additional loans. The credit squeeze exacerbated the decline in auto sales at General Motors and Chrysler LLC in recent months. In December, GM reported a 31% drop in U.S. sales from a year earlier, while Chrysler’s sales plunged 53%. The loan is similar to the $6 billion that GMAC, the finance unit associated with General Motors (GM, Fortune 500), received from Treasury on Dec. 29. But GMAC, as a bank holding company, received a $5 billion capital injection directly from the Treasury, as well as another $1 billion in Treasury funds via GM. By contrast, Chrysler Financial is receiving only a loan. A government official who briefed reporters Friday declined to comment on how much money Chrysler Financial had been seeking. The government official said that Treasury has also held talks with Ford Credit, the finance arm of Ford Motor (F, Fortune 500), but declined to characterize whether they are ongoing. The automaker said Ford Credit has been trying to access the government’s Term Asset Backed Securities Loan Facility (TALF), another government program to spur lending, and get the FDIC to approve an application that would allow it to become a bank. The money for Chrysler Financial comes from the Troubled Asset Relief Program (TARP), the $700 billion pool of money approved in October to help banks and Wall Street firms. The program has now pumped about $25 billion in loans and capital infusions into the automakers and their finance arms. The disbursement comes from the initial $350 billion in TARP money available since last fall, according to a government official. A Senate vote on Thursday released the second $350 billion pool from TARP. Treasury’s loan to Chrysler Financial will be secured by the newly originated consumer car loans issued with the money. and improvements at Portland’s best Ford dealer. The clock is ticking. The Wall Street Journal is reported to have said, that hybrid buyers have until the end of the year to get a tax credit for buying a Honda Civic hybrid, The dying tax credit is the latest in a series of changes chipping away at the financial incentives to buy a hybrid. Tax credit to buys of the strong-selling Toyota Prius, which gets about 46 miles a gallon, and Toyota’s other hybrid models ended about a year ago. The federal government is now phasing out the same incentives on Honda Motor Co.’s Civic hybrid, which gets 42 miles a gallon. This and the fact that fuel prices have fallen from their highs in the $4-5 a gallon range this summer, and it’s getting a lot more expensive to be an environmentally conscious driver. Maybe it is time for return to something that worked off the shelf 30 years ago. How about off the shelf diesel technology that gets 50-70 MPG without billions of dollars of R&D.